Praise! Praise! Praise, be unto the Lord, our God and Father! It is right to praise Him for all of His glorious works, but it is even more right to praise Him just because of Who He is! It is because of His great love, and grace, and mercy that we can walk in freedom! All that we have and accomplish is because of Him (Isa. 26:12)! Oh, how great is our Father Who cares so intimately for each one of us! I just want to praise Him, for it is because of Him that we can know how to love, how to serve, how to stand, how to overcome, how to reach others! He sacrificed His Son, Jesus, so that we could have an earthly example of all of this. Praise you Lord for Your great compassion and kindness to each of us! Even when we have been far from You, You have loved us. Even when we have been unfaithful to You, You have been faithful to us. Even when we have been mad at You, You have forgiven us. Even when we have walked away from You, You have pursued us with your big, bursting heart full of passion and desire for each and every one of us. Thank You for calling me Your precious child, even when I have walked in rebellion. Thank You for never turning Your back on me, for always receiving me, for always forgiving me, for always loving me no matter what! How could there be any as good and kind as YOU? If I poured out my heart of praise for You unceasingly for all of eternity, it would not be enough to express my deep thankfulness for You! As much as I may believe that I know all of Your great kindnesses toward me, I know there are even more of which I am unaware. Thank You for all of those also! Thank You for caring for me in ways that I know not. Thank You for so many blessings that You bestow upon me daily of which I am unaware, but which I will know someday know when I rejoice with You for eternity! Thank You for blessing me from Your heart so full and overflowing with good and love for me that You don’t require me to repay You for all the good You do for me. You just want me to receive Your love…and it is so great that I know I cannot conceive of its full measure! I know that every time I receive it, every time I feel it touch me, every time I contemplate its greatness, there is still more! Your love for me is boundless and without condition! Oh, Lord, would it be that we could each be that same love to all those around us! Show us how! As if it weren’t enough to praise our Father just because of Who He is, do you know that praising Him silences our enemies?! His Word tell us that, “Through the praise of children and infants you have established a stronghold against your enemies, to silence the foe and the avenger.” (Psalm 8:2; See also Psalm 18:3) Our praise, our thanksgiving in every situation stills the enemy and produces good in our lives. So, you see, God returns upon us blessing when we do praise Him and when we give thanks in each circumstance. 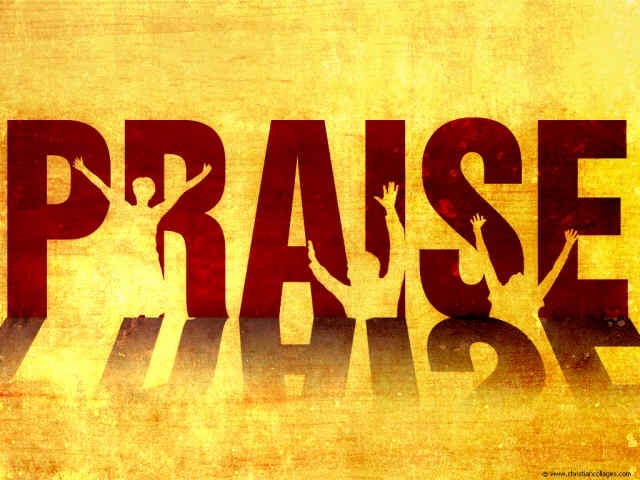 God does not want our praise only for His own glory, but once again, all that we do to honor Him brings us blessing. He makes sure of it! His heart is always to bless and help us!